Compact Jet Mill and Separator Combined System Kurimoto Pocket Jet | Product Information | KURIMOTO, LTD.
With the recent increasing improvements of powder performance and developments of new materials, the need for minimizing contamination and grinding or classifying a small quantity of samples has been increasing. Meeting this need, we at Kurimoto have downsized the time-proven Cross Jet Mill® and Sharp Cut Separator® and developed the Pocket Jet, which can serve as a mill or separator with easy change of the components. 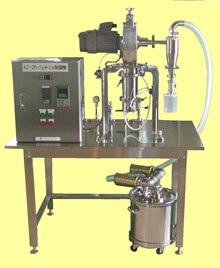 Can process a small quantity of samples with no contamination. 1) Various kinds of materials such as ceramics and coatings are available on demand as optional specifications.